Strolling along what could be mistaken for a seafront, were it not for the bank on the other side, you move away from the centre of the sleepy capital city. Vientiane doesn’t seem like the major city of any country, but here in Laos, it is what passes for the height of cosmopolitan. It’s a little ragged around the edges and is a mix of colonial and communist architecture. There are no skyscrapers or modern large-scale edifices. It is an impossibly quiet capital. Heading out from the city-centre along the banks of the Mekong, you are aimed squarely towards one of the most important temples in the city. The river beside you is said to be home to the ancient nāgas (magical serpents) who protect the city. 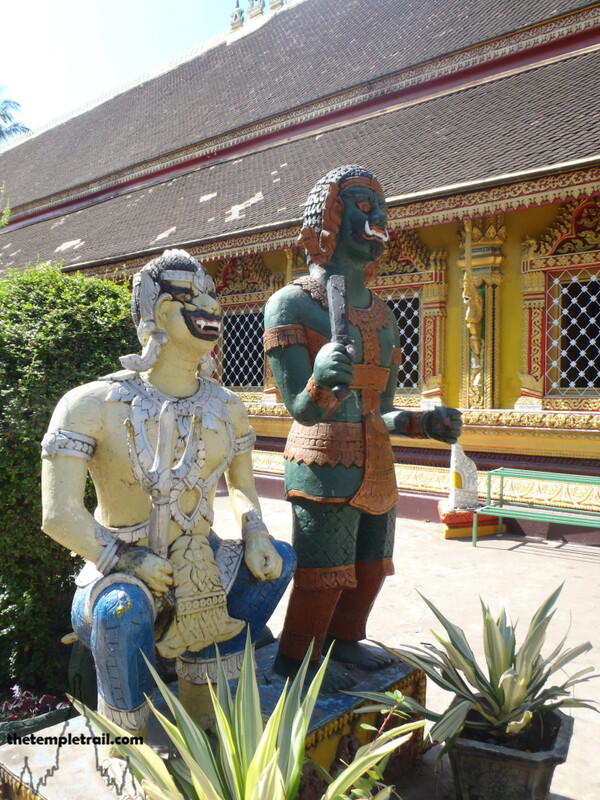 The protection of Vientiane has always been a major concern of its inhabitants. Historically, the magical protective measures put in place have not helped much. Even the mythical nāga that lives in That Dam couldn’t stop the sacking of the city on several occasions, particularly the Thai invasion in the 19th century and the eventual takeover by the French. Turning in through the standard elaborate temple gate, you see an ordinary-looking sim (ordination hall). The temple, from this view, appears unremarkable. Delving a little deeper, you realize that it really a puzzle-box of treasures. Wat Si Muang is the guardian temple of the city. It is home, not only to the typical Buddhist iconography, but also to the city pillar and a powerful protector spirit. 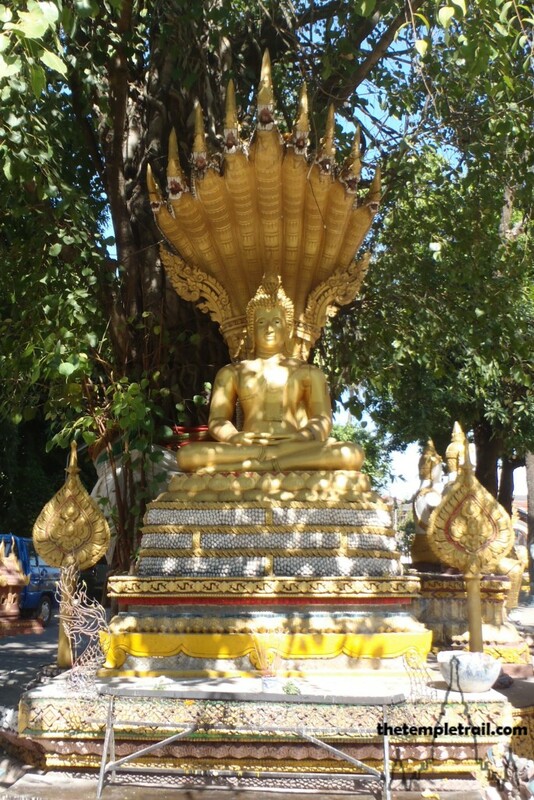 As you cross from the gate to the front of the sim, you pass a statue of Buddha under a huge Bodhi tree. The statue is in the Na Plok position; the Buddha serenely meditating while the nāga Mucalinda shelters him from the rain. The scene tells the story of the enlightenment of Gautama and his becoming the Buddha under the Bodhi tree. Crossing the path of the statue, you come to the entrance of the sim and its protective line of lion sculptures. The hall is a standard design except that it is divided into two chambers inside as opposed to the more usual single room. In the first chamber, you see a cushion on the floor with an odd-shaped stone resting on it. It is gilded and has lost a lot of the golden shimmer through wear and tear from handling. Kneeling down in front of it, you lift it three times. 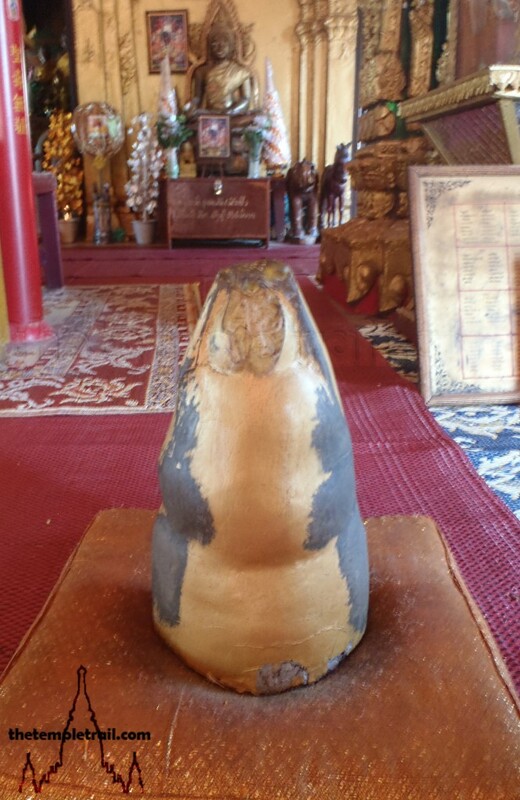 The ‘Buddha-shaped’ stone will grant good luck, enlightenment and the wishes of those who can lift it thrice from the cushion while kneeling. It is heavy, but not hopelessly so, and you lift it with moderate effort. From the front chamber, you move to the rear one. This place has something powerful and a little sinister as its main focus of worship. 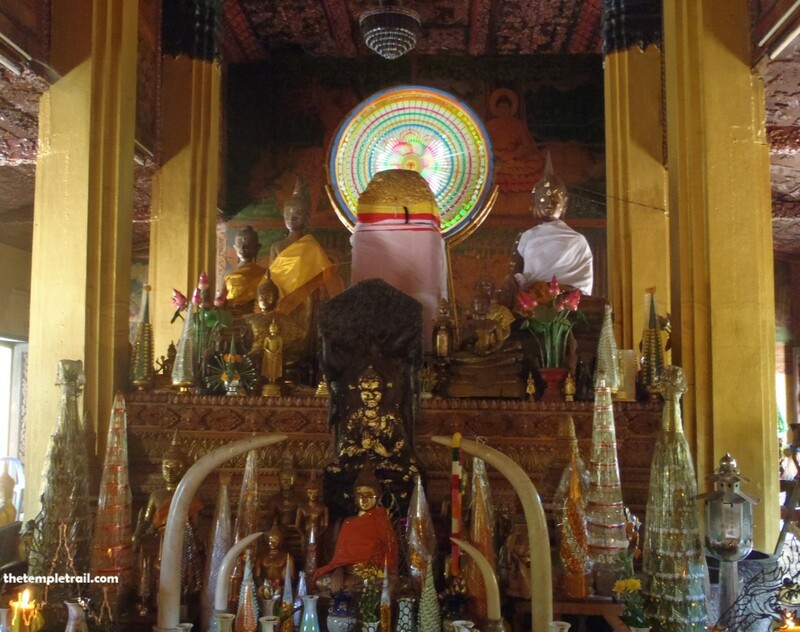 Surrounded by Buddha statues is the gilt lák meuang (city pillar). It is phallic in symbolism and harkens back to a much older religious tradition. The large golden stone pillar peeks out from the statuary that encircles it. Buddha seems to grant his blessings to the city in addition to those of the pillar and what lies beneath it. Like an iceberg, only the tip of the pillar is visible. The vast majority of its bulk is buried in the earth. The legend that surrounds the pillar is one of human sacrifice. 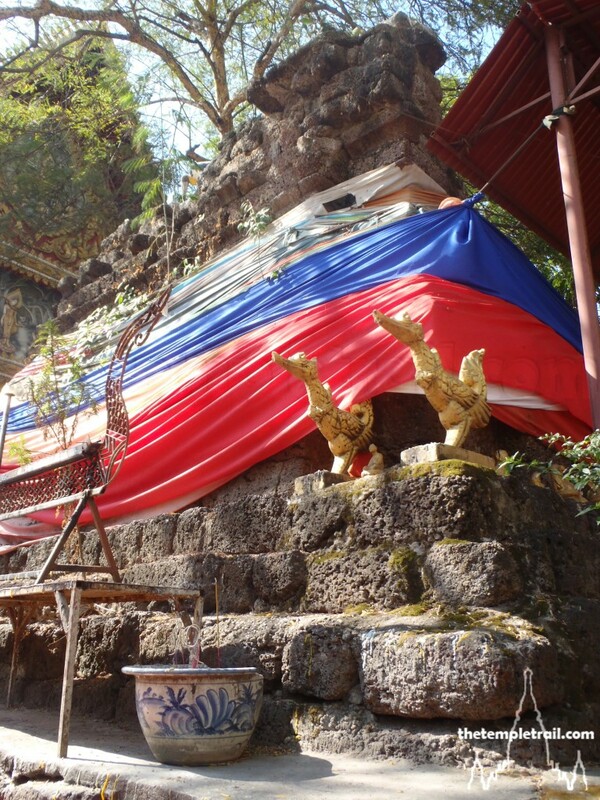 When the temple was originally built in the mid-16th century, a sacrifice needed to be made. A young pregnant woman named Si Muang volunteered and she was placed in the pit for the pillar along with a horse and the pillar was dropped in on top crushing her. This satisfied the local animist deities and also created a powerful protector spirit for the city. A phi (ghost) of a pregnant woman is considered in Southeast Asia to be a very powerful spirit. Usually they are malevolent, but as the woman volunteered, she is seen to be happy with her role. Her presence did little to stop the destruction of the temple by the Siamese (Thai) in the early 19th century and the structure that you stand in is the consequential rebuild from the early 20th century. After showing the guardian spirit respect, you move out of the dark presence of the pillar chamber and out into the light. The wat is built on a much older Khmer Hindu temple. The pillar may even have been a part of the older temple structure that was rehabilitated. Vientiane actually has two, the other being under Pha That Luang, but this is the more powerful older one. This is due not only to the legend, but also perhaps that it was part of a forgotten structure. People often marvel at ancient structures of unknown countenance and that is very much the case here. As you circle the sim, you come to a fenced off pile of stones. 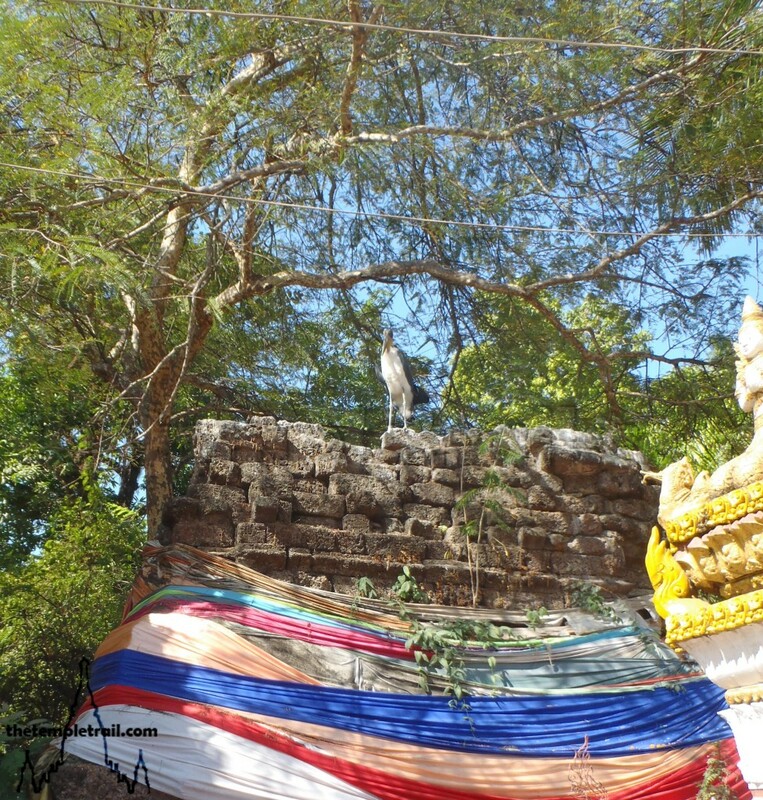 Looking with more scrutiny at it, you see that it is part of the ancient Khmer temple. 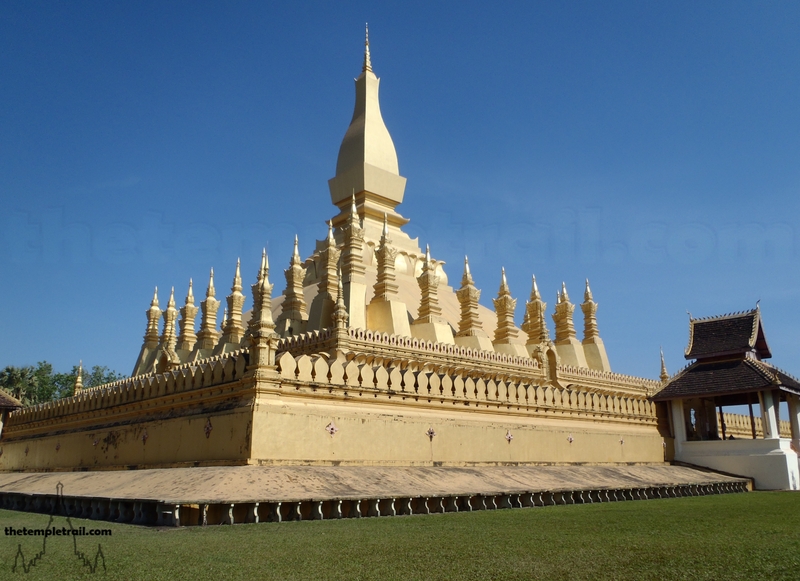 Wrapped in cloth, the Lao still revere what they refer to as a jęhdii (chedi or stupa). The ancient laterite blocks with their porous surfaces are draped in magical ceremonial fabric to contain and venerate them. The structure may have been a tower or sanctuary to a Hindu god, but it has certainly been reclaimed by the Buddhists. Also claiming it is a mean-looking stork. Peering down at you, he starts to get very territorial every time you approach the structure. Gingerly, you move around beneath the self-proclaimed guardian. On the other corner of the sim, more of the ancient structure reveals itself. It too has a stork patrolling its zenith. Hearing a whooping sound, you tear yourself away from the birds and their charges and seek out the source of the early morning noise. The grounds surrounding the sim are filled with small buildings and concrete statues. 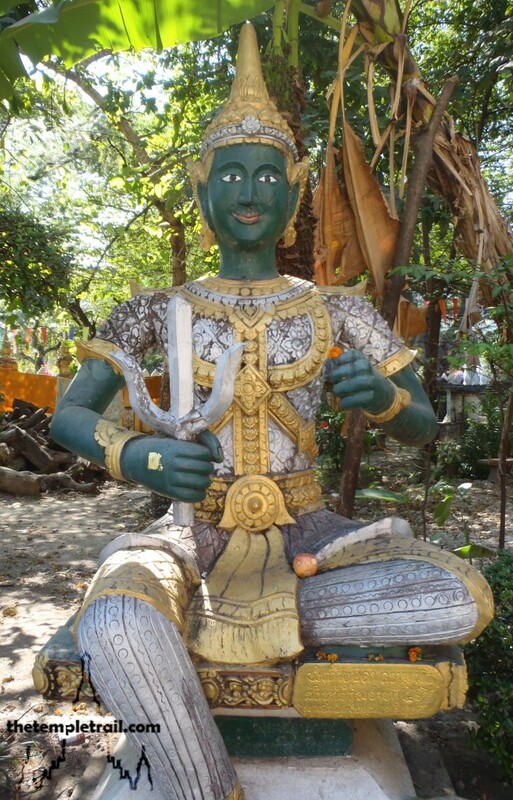 The statue collection is an education in the Hindu-influenced Buddhism that is practiced here. You pass Garuda (the mythical bird-man), Hanuman (the monkey god), Thotsakan (the demon king) and Śakra (Indra; the sky god, king of the devas and guardian of Buddhism) on your route to the source of the howling. On the way, you also pass a sala (rest pavilion) inside which sits a monk who beckons you over. You kneel in front of him as he says a prayer over you and ties a bright orange sai sin (holy thread) around your wrist. After putting a donation to the temple in the collection-box, you continue your search. Suddenly, a large caged enclosure looms into sight from around a corner. It shakes and clangs as the howls continue. They are not the sounds of distress and as you get within spitting distance, you see a pair of happy gibbons playfully swinging around with their distended arms. 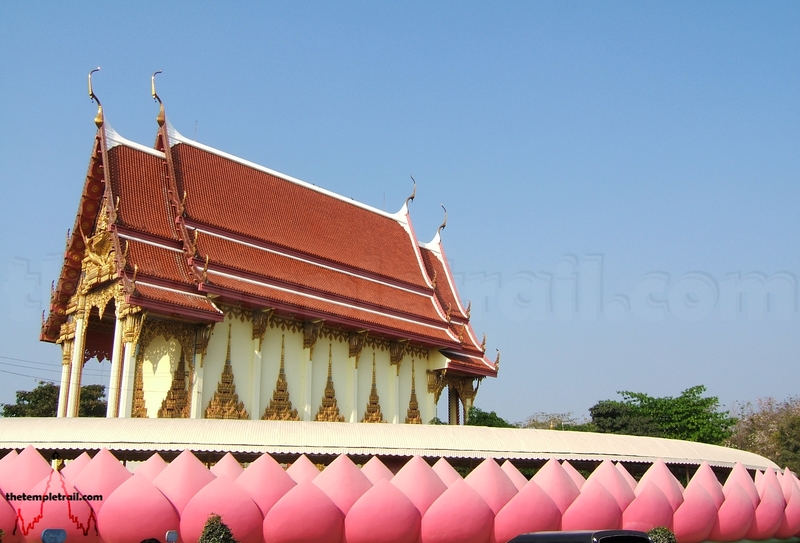 Their joyful hollers echo around the grounds and off the buildings of the wat. Walking back through to the road, you feel blessed with good luck from all of the different forces of Wat Si Muang. The Buddhist statues, the ancient Khmer buildings, the chanting monks, the animal guardians and the pillar with its powerful resident have all shone their good graces down on you. As you cross the threshold and out into the human world of modern day Vientiane, you feel you have brought a little of the spirit world with you. You have been granted a sort of protection for your remaining time in the ancient capital. Retracing your steps along the Mekong, you can almost feel the presence of the nāgas. The spirits of the river and the land vividly come to life in this nāga city of the Mekong. « Why Do People Build Temples?